Waukesha’s history can be broken into three developmental stages of the city’s progression: early settlement, early industry and commerce and the springs era. 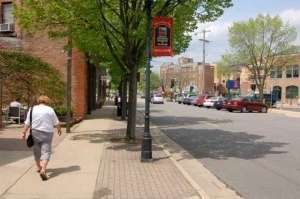 The city of Waukesha, originally known as Prairie Village, was lush with forestry and prairies along the banks of the Fox River which first served as the home to resident Indian tribes like the Sauk, Menomonie, Winnebago and Potawatomi. These tribe’s prehistoric ancestors left behind a number of earthen mounds in which early pioneers reported 11 groupings of 55 mounds. A number of the mounds were conical or linear, while others were the forms of birds and reptiles and some of which were for burial. 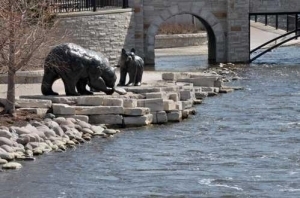 Prior to the 1830’s the area was not visited by many white settlers due to its inland location and the Fox River not serving as a water highway. European settlers came only to the area to set-up fur trading posts between their new encampments and established cities like Milwaukee. The first permanent white settlers - Morris D. Cutler and Alonso Cutler - arrived in 1834 seeking to make their claims for homesteads. In 1836, the resident Indian tribes formally lost title to the land and were removed by the federal army. Upon the removal of the tribes, southeastern Wisconsin’s settlement quickly began to grow. The first sign of industry came in 1838 when a sawmill was constructed along the Fox River to supply lumber for community building projects. Immediately following the sawmill was the construction of a large flour mill – Forest City Mill - which began operations in late 1839 and featured the only smutter, a device used to clean the grain, in the entire territory. In 1840 land leased from Morris Cutler was developed into a limestone quarry, the village’s first manufacturing plant was erected 1845, and Hickory Grove Brewery opened in the 1850s. Juneau Solomon – a Milwaukee native – was the first supplier to the area. His small store allowed settled families in the area to purchase the provisions needed to survive the difficult winter of 1836-1837. Then the arrival of the first permanent general store in 1839 and first hardware store in 1847 solidified the village as a growing hub. 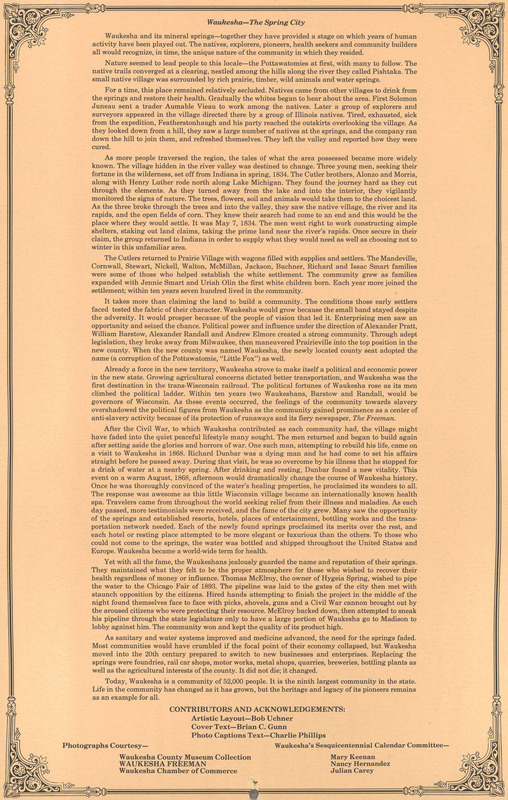 The first local newspaper reporting local, state and national news called the American Freeman printed it’s first edition in September of 1844, followed by The Waukesha County Bank established in 1855 where, with some changes, remains in operation still today as Chase Bank. 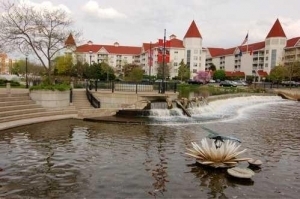 Waukesha, translated to mean "By The Little Fox", gained world notability as a great and prosperous resort area during the last quarter of the nineteenth century. The entire tourist boom experienced can be traced to Colonel Richard Dunbar. Suffering from painful diabetes, Dunbar accidentally discovered the alleged "healing effects" of the local spring water. Ending the search for a cure for his illness, he spent the last ten years of his life believing and promoting that Waukesha spring water could indeed cure certain sicknesses. 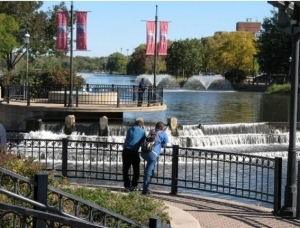 About 1916, the resort days of Waukesha faded and gave way to what is now a thriving city of more than 63,000 residents representing diversified industry, educational institutions, strong health care facilities, attractive and friendly residential areas and a qualified and experienced hospitality industry. 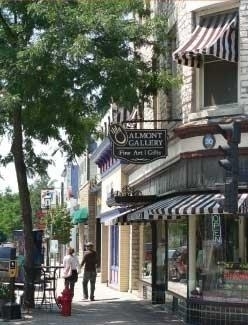 While visiting Waukesha, you can catch glimpses of our bygone era in the many parks, museums and carefully restored architecture of the downtown district. Alfred Lunt attended Carroll College and went on to become apart of one of the greatest acting partnership in American theatre. His acting partner and wife was Lynn Fontanne. 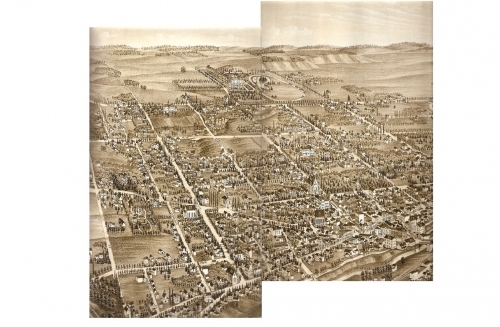 This picture of Waukesha shows an 1880 birds eye view of the downtown area and parts to the south. Five Points is located in the lower right quadrant. 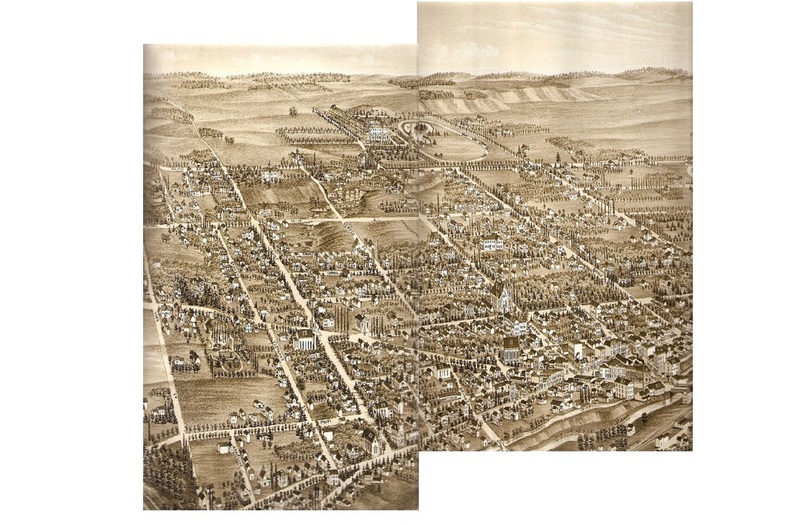 To the south (up in the pic), follow Grand Ave to see Union School (the HS at that time) and further out the Fountain Springs Hotel. Are you able to identifying other landmarks, if so let us know and it will be duly noted.